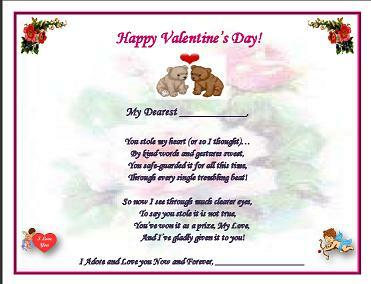 The Certificates for Valentines Day is a special gift for your spouse. It's a way to show him or her just how sweet and special they are to you on this special Valentines Day. This is great for someone who is looking for a last minute Valentines Day gift to buy for their loved one and/or trying to save money at the same time. Here is a free gift and a very special one too. You can even change the wording if you would like. Through every single trembling beat! And I’ve gladly given it to you! If you are good at writing poems, then go for it and write the Love of your Life a beautiful poem. If the two of you are dining out on Valentines Day, put on your most attractive clothes that he or she loves and bring the poem and Valentines Card to the dinner with you. Prepare to make the evening the most special and enjoyable that you and your spouse have ever experienced. There are many more Valentines Day ideas that can be explored for this special holiday. It makes you warm inside doesn't it when you are trying to find that special gift to let your spouse know how special he or she is to you. If you don't do anything else make sure you have a card, certificate or something that has those special words explaining how much you LOVE THEM. Return to Valentines Day Ideas from Valentines Day Certificate.